I have now been backpacking through south-east Asia for eleven months. As I look back across the map I am totally awe-struck by the beauty of this part of the world. My travels have largely centred around visiting places of spectacular natural beauty. While I love to endulge in certain ‘city-centric’ luxuries (code for patisseries) I feel most at peace when immersed in nature. This is also where I feel most empowered and responsible for my actions. While knitting this Yarnbomb for Vietnam, I thought about this responsibility. As this pattern required significant attention and careful interweaving of the various threads it was knot a quick knit. It began in Koh Phangan and came with me through Bangkok, Ho Chi Minh City, Dalat and Hoi An. It was tucked away in my backpack as I took trains, planes, taxis, buses and motorcycles-all the while surrounded by people from all over the world. This year of knitting and travelling has highlighted a few things for me, one of which is how many people we share the planet with. I am pretty sure living on Mars will eventually become an option, but I don’t think it’s going to open up as an option for any of us alive right now. Thus, that leaves us with only one choice of where to live -Earth. 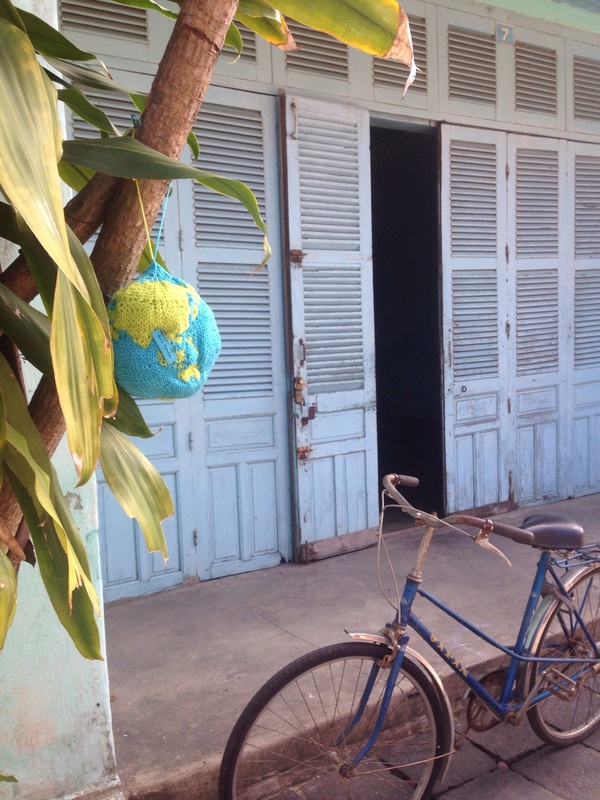 This knitting was installed in Hoi An- a beautiful lantern strewn city, protected by UNESCO world heritage site status and a major tourist draw. Knitting it made me think about how we are all interconnected with the earth and must take care of it for it to take care of us. Do you ever use your crafting as a meditation? I’de love to hear what everyone is thinking about during their current projects. I know it’s holiday knitting season too, so perhaps this means you infuse specific ideas or emotions into your knits? Whatever you do, let me know in the comment section below or through Twitter. 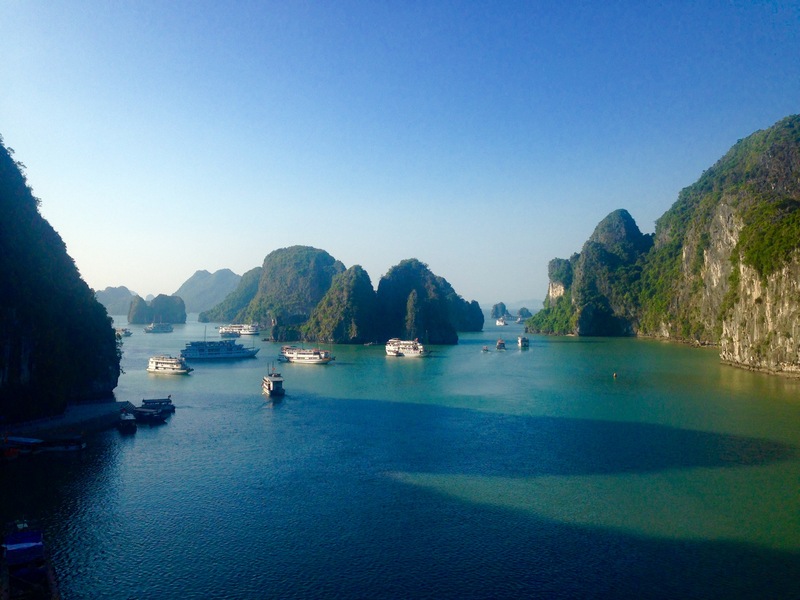 And if you want to see more pics from my adventures in Vietnam, be sure to check out my Instagram account. Installation Details: Knit with acrylic and cotton yarn and stuffed with plastic bags. Installed and removed on October 24, 2016 in Old Town, Hoi An, Vietnam. 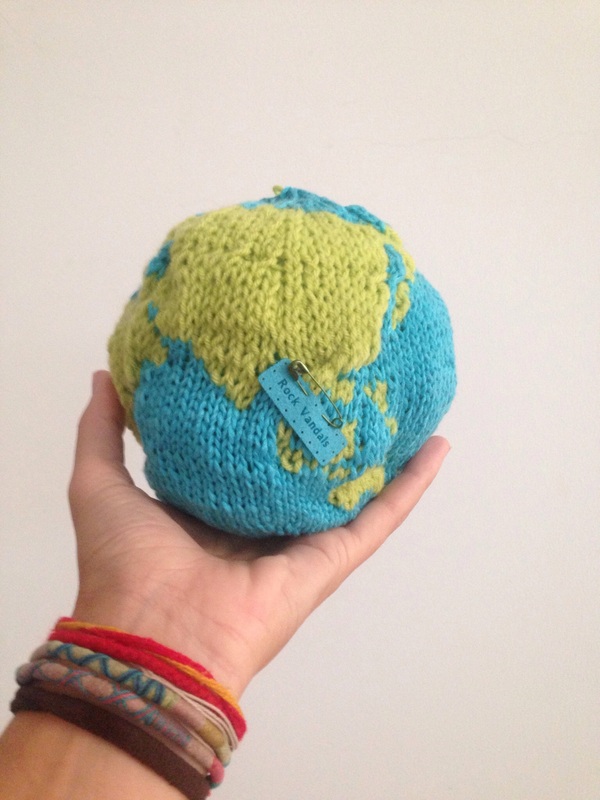 I love the knitted globe. Thanks Brenda. I love that someone went through the difficulty of making such a complex pattern and then gives it away for free. Very cool & generous, if you ask me! Hey Susanne, I hear ya about mindless knitting. I love me a good Tedx talk or trashy reality tv binge, or as you say road-trip knitting. We are lucky in NL to have endless stretches of highway-could probably knit one whole sock en route from Twill to St. Johns, will have to try once I’m back!